Toilet training in our house has always been achieved with a large jar of M&Ms and a stash of chocolate frogs – an M&M for successful ‘quick visits’ and a chocolate frog for ‘bigger jobs’, if you get my meaning. I’ll admit I have been criticised for this approach – many well-meaning friends and family members have suggested that perhaps stickers on a reward chart would suffice. Maybe, but for something as major as toilet training my approach has been ‘speak their language’ (i.e. chocolate) and the whole experience is done with pretty quickly. I will confess that this strategy did result in my kids saying “I need a chocolate frog” rather than “I need to do a poo” for a short time but hey, we got there in the end! 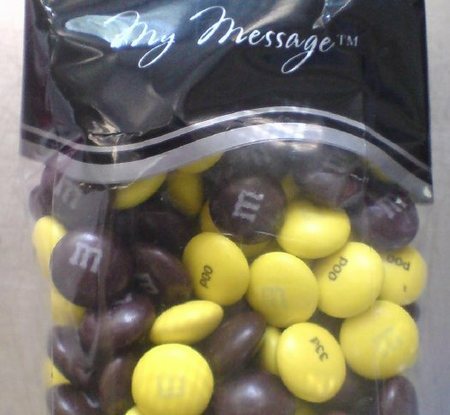 A fan of customisable M&Ms, Greg Allen, obviously supports my ‘chocolate-bribe-toilet-training’ strategy because he came up with his own true toilet training currency – pee and poo M&Ms. For a longer lasting toilet training memento, consider a plush Pee & Poo (yes, really).